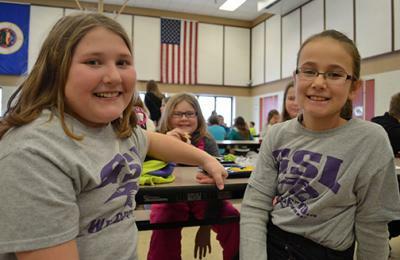 Glencoe-Silver Lake fifth-graders Kaylee Dose and Kassima Pedersen show off their school pride T-shirts on “Get To” Day on Wednesday, Jan. 20. Though most school days involve learning new words, Glencoe-Silver Lake students are working to erase one phrase, “have to,” from their vocabulary. The effort is a part of GSL’s “Get To” program that focuses on inspiring students to be grateful for their education with T-shirts and monthly “Get To” days. “The whole concept is that you don’t have to go to school, you get to go to school. You don’t have to be on time, you get to be on time. You don’t have to get your work done, you get to get your work done,” Superintendent Chris Sonju explained. The concept started from small exchanges Sonju had with kids, reminding them to appreciate the opportunity. After these exchanges, Sonju said he wanted to take the idea to the next level. That is when the T-shirts came into play. Stevens Seminary provided shirts for every student and staff member. The district established a day each month for everyone to wear their shirts and recognize the concept. “What I wanted to do was to really celebrate it,” Sonju said. The program has been around for four years and is now in its second phase and second T-shirt design, Get To 2.0. The next version of shirts, Get To 3.0, will be released alongside the opening of the district’s new building. In order to get a T-shirt, students had to sign a pledge promising to pick up a piece of garbage when they saw it, to not cut the corner on the path between Lincoln Junior High and GSL High School, and to do their very best in everything they do. These rules were chosen to help the students learn about integrity, respect, character and responsibility. For more, see the Jan. 27 print edition of The Chronicle.